Japanese antiques provide a link to the rich culture and fascinating history of Japan. Best buys include antique porcelain, bronzes, mingei, tea wares, prints and paintings. Antique Japanese fine art and porcelain are inextricably linked with the rich culture and fascinating history of the Far East. They are wildly admired, studied and collected. The exquisite beauty, artistry and craft of Japanese antiques displays a masterful aesthetic. 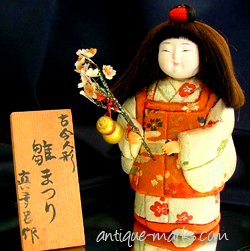 Many, such as Japanese dolls and Japanese swords, endure as clues to the past. While other antiques, like Japanese furniture (tansu) and Japanese porcelain, are still practical and useful today. The Japanese have some of the oldest ceramics ever produced, with the earliest Japanese porcelain dating to around 10,000 BC. Popular Japanese Pottery & Porcelain items include Imari, Kutani and Satsuma wares. Kutani wares are Japanese porcelain decorated using a five colour palette. The main colours consist of red, green, yellow, purple and blue. The colours in the glaze have a glass like transparency with yellow and green being the most prominent. The center of Kutani porcelain production is Terai City in the Japanese Ishikawa prefecture. Noritake wares are very collectible, production began around 1876. There is high demand for good quality pieces even those with some wear to the handles, which is quite common, and they can fetch good prices. There are three commonly seen Noritake marks; namely the Noritake Maruki (often called Komaru) Mark; the M (for Morimura) Wreath Mark and the RC (for Royal Crockery) mark. Rare and collectable Japanese Antiques are increasing in popularity and value. Add a few to your Oriental porcelain collection and you could reap rich rewards.